Urushi is the name of a natural lacquer and the name of the traditional japanese lacquerware, that flourishes since the 6th century (or even earlier). Urushi is the sap from the trunk of the (japanese) Lacquertree ("Toxicodendron vernicifluum", "Urushi no Ki", also known as "Lacquer-Sumac" ). Uncured the lacquer is of a light cloudy brown or amber color, once cured it is clear and dark honey- or amber-colored. Parts have to be cured in controlled conditions, with constant moisture and temperature, to ensure a complete polymerization of the urushi (Usually lacquers are cured when a volatile solvent, in which resins are dissolved, evaporates. However urushi is polymerized by an enzyme - laccase - to give a cross-linked polymerized film, it is polymerized without any volatile solvent that is evaporating, this process works only under the right conditions, in very thin layers). The uncured lacquer contains urushiol, a yellow, oily liquid, that contains derivates of the 1,2-Dihydroxybenzol (Brenzcatechin). 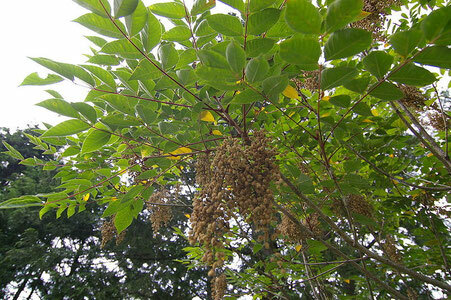 Like the sap of other sumac trees (like the staghorn sumac, the tanner's sumac or the cashew- or mango-tree) the sap of the lacquer tree is a strong allergene. It can provoke a urushiol-induced contact dermatitis (also called Toxicodendron dermatitis and Rhus dermatitis). Therefore urushi lacquer needs to be handled very carefully with rubber gloves. The lacquer needs to be painted in very thin layers, each layer has to be sanded after curing to ensure an even and smooth surface. The lacquer can be colored with pigments like soot (black) or ironoxide (red), it can be used in the natural amber color as well. It is possible to sprinkle metal powder, glitter etc. into the lacquer, urushi is a strong adhesive. After the final sanding with very fine sandpaper and micro meshes "Kijo-mi Urushi " is used to fill small pores and scratches, after curing the item is polished over and over again, until a glasslike finish is achieved. When it solidifies, it becomes a very hard coating that waterproofs and protects the coated object from the effects of mold, mildew and other forms of weathering. It also provides protection against caustic substances such as acids. Only direct and prolonged exposure to sunlight will cause urushi to deteriorate. Urushi's hardness and durability make it an excellent protective coating for any object that will be used continually over a long period of time.